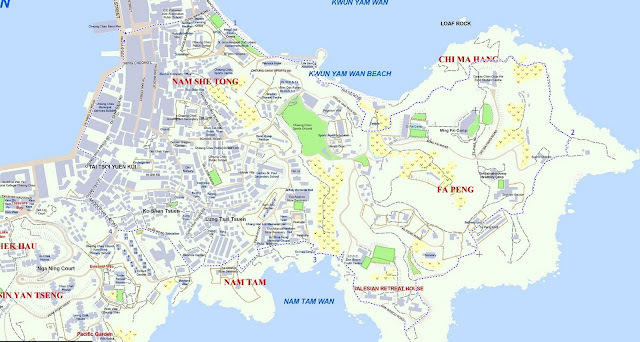 Transportation: Take Cheung Chau ferry from Pier 5 in Central. Ferry every half hour, alternating between regular (an hour to Cheung Chau) and fast ferry (half and hour). Right off the ferry, go straight, slightly to your right to the main piazza. On the piazza, head left. You'll go buy restaurants and a few food stalls. Good stuff to be had there but you came here to walk, right? After just 2 minutes walk, you'll have crossed to the other side of the island, arriving at Tong Wan Beach. Go straight and turn right onto the path following the beach front. Keep going by and around the hotel. Around the restaurant and to the beach path. On the paved beach path. Going up about mid-beach. Head left into the mini great wall. Basically, it's just a fancily paved path with a stone railing. Nice see views along the way. At the pavilion, take the path down on the right. You'll eventually reach a set of stairs. You will want to take the stairs and go up on your right. 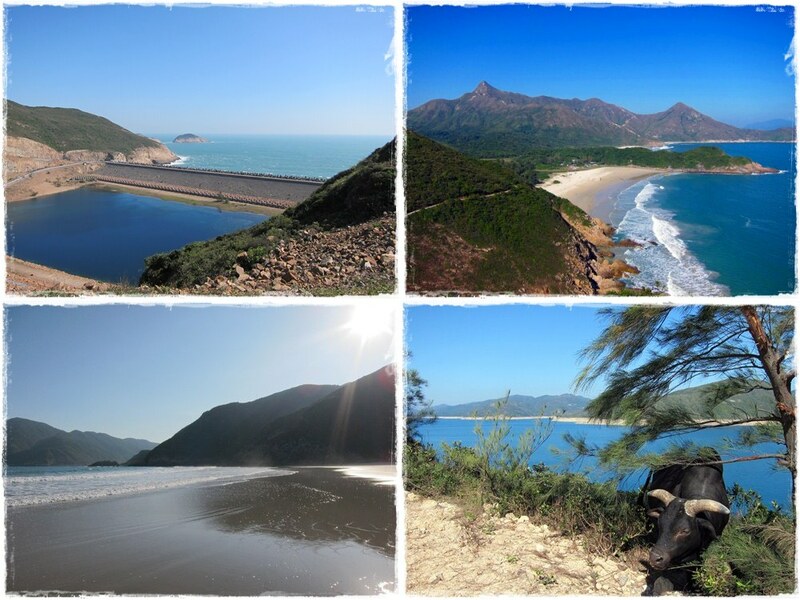 But before you do so, you can take 10 minutes and go to the end of the path where you'll get a nice view and some interesting rock formations. After the stairs, after a short walk up. Go straight . You'll reach a somewhat out-of-place housing development (complete with a pool) surrounded by a wall. Follow the wall and turn left at the end (by the electrical box) on Don Bosco Road. Head right. On the left if just some private compound. You are in sight of Nam Tam Wan and its small beach with a Tin Hau temple. Don't take the first left, keep going straight. 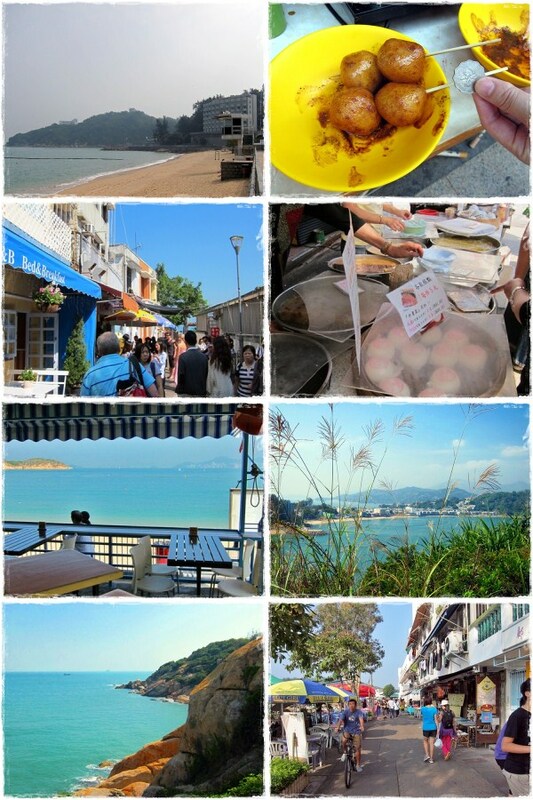 This one you can go down on your left towards the beach and Tin Hau temple. The temple by the beach. looks like a private hour. The path is actually on your right, before the temple. Go have a look at the temple and when ready, go up the path. Stay on the left there. Follow the main road on the left still. Stay on the main road (Peak Road), keep right. You'll eventually reach a pavilion. There's a map there to guide you. But if you take Middle Road down on the right, you can\s really get lost; you'll be back to the pier in 10 minutes. Sample some of the local food before heading back to Central. About 4 hours total. 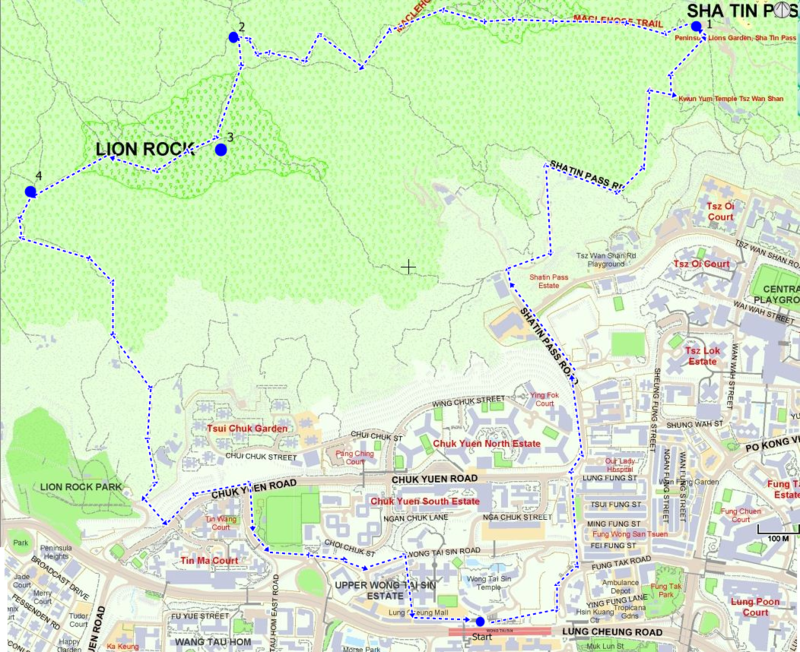 1 hour from Wong Tai Sin MTR to trail head (#1). 1 hour from trail head to bottom of Lion Head stairs (#2). 1 hour to Reunification pavilion (#4). One hour back to Wong Tai Sin. 7/10. Beginner hikers may find it tiring as there are quite steep climbs. Off of Wong Tai Sin's exit B3. Take a right and go straight forward after the stairs and old ladies selling Joss sticks. You will reach the mini-bus terminus. Head left when you have reached the terminus and turn again left onto Shatin Pass Road. You'll stay on this road until you reach the trail head. I added a few key pictures along the way for reference. Keep going on Shatin pass road. Don't be fooled, you keep going straight through, still Shatin Pass Road. And up you go. Shatin pass road all the way! 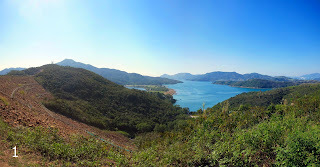 You will go by a temple on your left (nice and peaceful inside if you have a few minutes), Shatin Pass curves to the right, you follow. You'll eventually reach this ornate Chinese arch. Just a few hundred meters to go on Shatin Pass road! That is the trail head (marker #1 on the map). 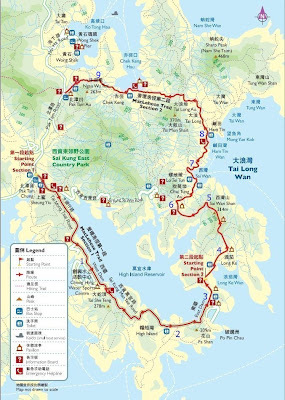 If you keep going on Shatin pass for another 20 or so meters, there will be a store where you can replenish your supplies before starting on the trail. There are washrooms there as well. Once you are ready to go, it will be up hill for the next half-hour. 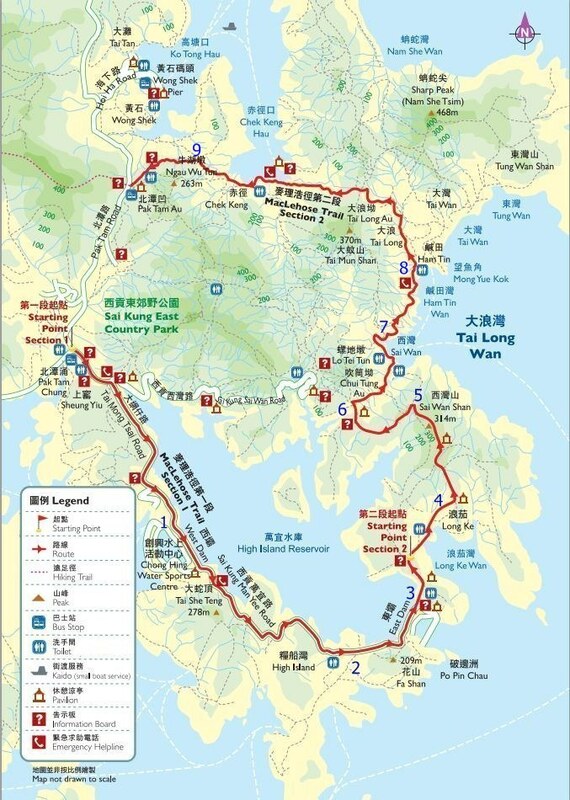 About one hour in (a few hundred meters have mile post M104), marker #2 on my map, you will reach an intersection which offers you to climb to the Lion Rock, or bypass it altogether. Head left and climb up. Otherwise, you'll miss all the nicest views. After about 20 minutes of quite steep climb, you'll reach the first mountain crest (#3). at 495meters. Soak in the view and when ready keep walking on the crest. It may look like the trail stops but it doesn't. Keep going. Just be careful on the way down as it can be slippery. You'll climb the next peak. Keep going,. In front of you is the Lion Rock! On the left, you can climb up if you want to say you truly went on top of Lion Rock. The trail however, continues on the right. On your way down, keep on eye on the Lion Rock in the back as you may see rock climbers scaling the peak. Take the first paved trail on the left of the distance/direction post. All the way down. About an hour to Wong Tai Sin now. There may be a few tempting intersections; stay the course on the paved trail. End of the trail. 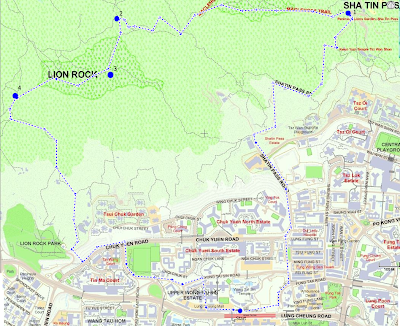 You are pretty much at the entrance of Lion Rock park. Quite nice I am told. Head left down the road. About 50 meters down, take short-cut stairs on you left. 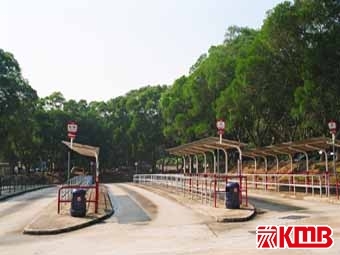 You will reach Chuk Yuen Road. Head left on Chuk Yuen. You'll reach at set of lights about 200 meters on Chuk Yuen Road. Cross the street and forward into Ma Chai Hang Road. There will be a park on your left. Keep on the sidewalk. After the roundabout, the road becomes Wong Tai Sin Road. Keep going. You'll reach a set of lights on Wong Tai Sin road and across, the road, you'll see a pink gate (Upper Wong Tai Sin Estate). Cross the street, go through the gate and down to estate's piazza. Go right through the estate. There are MTR signs for you to follow. Get into the shopping plaza and there will be further MTR signage. You'll be back to exit B3.